Joe Porenta sent in this one. 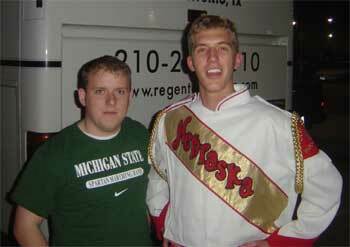 "This is a picture of Joe Porenta (left) and Jason Jerger (right), snare drummers for the 2004 Colts, outside of the Alamodome in San Antonio. "Jason and I met at the December Colts camp and found out that both of our schools (Michigan State University and University of Nebraska) would be traveling to the Alamobowl that December. We became quick friends while hanging out at the Alamobowl and both went on to make the Colts snare line." Thanks Joe! E-mail your best shots from the summer to dave@dci.org along with where and when the photo was taken. Send some biographical information about yourself as well. We'll give you full credit. Also, let us know if you want your e-mail address included.